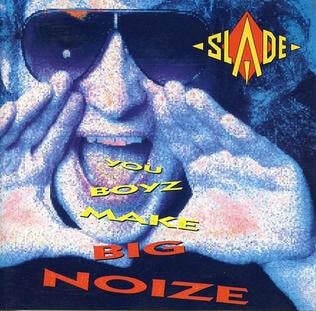 You Boyz Make Big Noize is a non-album single, released by Cheapskate Records on 31 July 1987. Named after the band's 1987 album of the same name, it reached No. 94 in the UK charts and remained in the chart for the one week. The song was written by Noddy Holder and Jim Lea, and produced by Lea. The song did not appear on the UK/European release of the You Boyz Make Big Noize album. However, later editions would add the song as the thirteenth track. For the album's CBS release in the United States, released in August 1987, "You Boyz Make Big Noize" was included, replacing the fourth track "Fools Go Crazy". In 1986, the band recorded their fourteenth studio album You Boyz Make Big Noize. Although the band hoped the album would put them back in the public eye, it failed to achieve the expected level of commercial success. The disappointing chart action ultimately resulted in the end of the band's contract with RCA. Shortly prior to the album's release in late April 1987, the band returned to the recording studio to record "You Boyz Make Big Noize". Although RCA passed on the option to release it, they gave permission for the band to release the song on their former independent label Cheapskate Records, with RCA providing the distribution. The single was released in July 1987 and reached No. 94 in the UK. The song also reached No. 6 on Sounds Hot Metal 50 Chart. "You Boyz Make Big Noize" featured Beastie Boys rap-styled verses. Prior to the song's release, Dave Hill described the song as "a "rock rap" thing with a Beastie Boys feel to it." The ending of the song references Slade's 1972 hit "Mama Weer All Crazee Now" with the line "Here come the boys who make a lot of row, mama, mama, mama we're all crazy now". The song featured vocals from Vicki Brown, wife of singer Joe Brown. It was the band's first single to feature female vocals since 1976's "Nobody's Fool". In a 1987 fan club interview, Lea explained how Brown came to be on the song: "She was wandering along a corridor and Noddy said "ere, you're female, do you want to be on our record?" She was not supposed to sing, she was supposed to say two lines but she sang one of the lines and she had this amazing voice. I wish we had written more for her." In a 1987 fan club interview, Holder explained the song and its release: "Well, the situation here is that, although all the members of Slade really like this new song and want to see it released as the next single, RCA don't want to release it themselves. They have, however, given us the option to release it independently on our own label, with RCA distributing it. Our deal is not up yet at RCA, they've just agreed to let us release this one single on our own. CBS really like the song as well, so it looks like the American version of the album will include this song as the title track. The song is an up-tempo rock thing in the Beastie Boys sort of ilk. The B-side will probably be an instrumental version of the same song. There will also be a 12" extended version. At the moment there are several different versions of this song with different lyrics, so we've got to try to decide on which ones we are going to use." "You Boyz Make Big Noize" was released on 7" and 12" vinyl by Cheapskate Records in the UK only. The B-side, "Boyz (Instrumental)", was exclusive to the single and would later appear on the band's 2007 compilation B-Sides. On the 12" single, an extended version of "You Boyz Make Big Noize", dubbed as the "Noize Remix", was featured as the A-side. A second B-side was also included; the "U.S.A Mix" of the song. The artwork for the single is the same as that of the You Boyz Make Big Noize album. The first pressings of the 7" single accidentally featured the "U.S.A Mix" on the B-Side instead of "Boyz (Instrumental)" that the sleeve stated. In a 1987 fan club interview, Lea said: "My brother Frank would say it was my fault. What happened was I cut it, told him what to do and I actually left but it was not done in the right order. I only found out by accident. If it was anybody's fault then I take the blame for it but I cannot see how it happened." No music video was filmed to promote the single. In the UK, on 15 August, the band appeared on the ITV show Get Fresh to perform the song. Bren Laidler featured with the band, miming Brown's part in the song. Boyz (Instrumental) is an exact copy of the single version minus vocals. You Boyz Make Big Noize (Noize Remix) opens with Holder singing the last line of the song, followed by an extended guitar solo section which was exclusive to the remix. The first two verses and two choruses run exactly like the single version and is followed by another exclusive guitar solo. After this section, the remix follows like the single version with the final verse and the ending. The final part of the track features a group singing the chorus line of "Mama Weer All Crazee Now", complete with party atmosphere sound effects. The lead guitar heard on the "Noize Remix" was played by Lea rather than Hill. You Boyz Make Big Noize (The USA Mix) is a remix of the original version, designed for the American music market. This version follows the same layout of the original, with the exception of a few small differences. Some lines were altered on the remix, with some lines being completely re-written. Kerrang! said: "Never thought I'd find myself saying this after giving the boyz' last album a bit of a slag, but I LIKE IT! Especially the 12" Noize remix with the Noddy rap proving they've got the measure of those nasty Beasties, who could learn a lesson or two from the original rabble rousers. In a review of the American version of the You Boyz Make Big Noize album, American newspaper Record-Journal described the song as a "rock-rap novelty cut".